The reality in Washington D.C. is if you live in Tenleytown versus if you live in Anacostia, you get two wildly different educational experiences. It’s the biggest social injustice imaginable. What we are allowing to happen in this day and age, we are still allowing the color of a child’s skin and the zip code they live in to dictate their educational outcome, and therefore their life outcome. … We are robbing them every single day of their futures. And everybody in this country should be infuriated by that. People tell me the unions are an inevitable part of this [school reform]. My thing is, what has that gotten us so far? All the collaboration and holding hands and singing ‘Kumbaya’? –Michelle Rhee, 2008 round table at the Fordham Institute. For the last two decades, urban school reform has taken a front seat in national affairs. New York Mayor Michael Bloomberg and former Chicago Mayor Richard M. Daley wrestled control of their respective cities’ education systems. Each saw the school system as a means to improve the plight of lower income constituents but also as a way to draw the middle class back into the urban fold. Daley spoke so often about the latter that it practically became a fetish. Teacher’s unions confronted both mayors and in the case of NYC, educators received concessions like better pay, but also agreed to longer days and school years (in Chicago, it’s a bit more complicated). Bloomberg repeatedly awarded New York educators with higher salaries while getting the United Federation of Teachers (UFT) to give on other significant areas. Reforming urban school systems requires more than mayoral dedication; reform demands an education czar to carry out orders and impose their own vision. In Chicago, current Secretary of Education Arne Duncan and Paul Vallas (currently busy rebuilding New Orleans’s public schools) before him filled this position. In New York, the indefatigable Joel Klein served as Bloomberg’s muscle. So it should come as no surprise that for the past several years, Washington D.C. had been following a similar route. The recently ousted Michelle Rhee served the same role as that of Vallas, Duncan, and Klein under the deposed Mayor Adrian Fenty. Since her departure from the D.C. government, she has been a regular feature in the news. A recent New York Magazine feature described her as “a sort of wonky Che Guevara, lending celebrity, credibility, and covering fire to political leaders who endorse her vision of school reform. “ Having appeared on countless news programs, the indie documentary Waiting for Superman and undoubtedly most importantly Oprah, Rhee had established a tough-minded persona that promised bad teachers future unemployment. She closed underperforming schools, fired incompetent educators, and laid off administrative staff. She wrangled with the D.C. teachers union, offering significantly increased pay in exchange for ending tenure. As New York Magazine journalist Andrew Rice points out, Rhee’s whirling dervish energy and commitment made her a congenial figure to both people on the left and the right. Moreover, in many ways, Rhee’s approach resembles the Obama administration’s new emphasis on good teachers as the key to school reform. A demanding technocratic leader like Rhee seems pitch perfect for the times. If there is one group ripe for popular backlash, teachers are front and center. Recent events in Wisconsin aside, union struggles to remain relevant have been widely documented. With shrinking membership and a population working in a private sector that promises far less in job security, many American workers find union complaints about benefits to be obnoxious. Unlike the Bloomberg/Klein or Daley/Vallas-Duncan combination, Fenty/Rhee aggressively attacked the union. To be fair, teacher’s unions have been guilty of retarding school reform in an effort to protect workers’ benefits and rights. From the authors’ collective experience, the UFT sometimes cared too much about protecting incompetent teachers or enforcing seniority rules than ensuring that excellent teachers filled the classrooms. Moreover, as with any large organizations, some union representatives were better than others. According to New York Magazine, over the past decade, the public’s esteem for teachers has slipped to the point that now Governors like New Jersey’s Chris Christie feel comfortable “attacking teachers as welfare queens.” If one were to believe that this was the first time teachers have been vilified one would be mistaken. Diane Ravitch documented the conflict and gnashing of teeth that have occurred throughout the New York City school system’s existence in her 1974 classic The Great School Wars: A History of the New York City Schools. 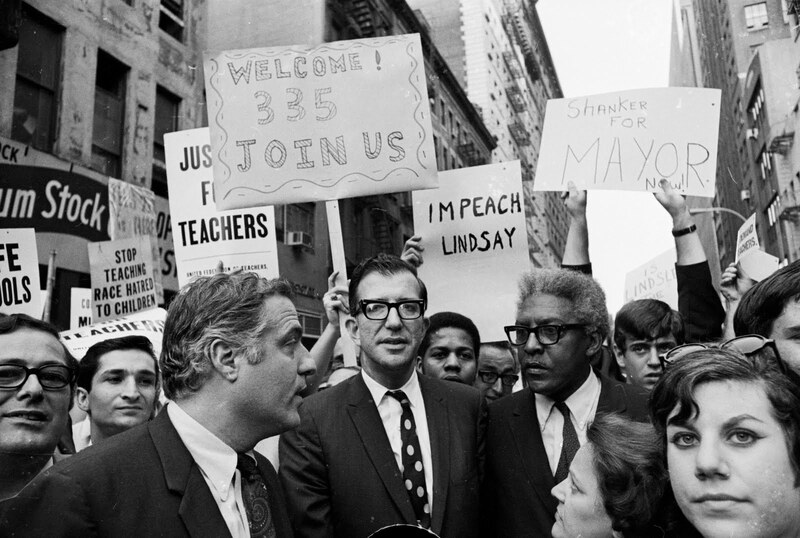 In its early stages of development, New York’s teachers were political appointees made by local bosses. Furthermore, many political leaders viewed this burgeoning public system as a font of patronage employment. By the 1960s, teaching had been professionalized. Moreover, the teacher’s union, as led by Albert Shanker, represented a largely Jewish workforce. The city’s schools consisted of largely black and brown faces. In the heat of the late 1960s rights movements, a union made up of a religious minority clashed openly with the city’s dominant racial minorities. During the 1968 Ocean Hill-Brownsville school controversy, Puerto Rican and Black parents lodged numerous complaints against New York public school teachers ranging from what we today refer to as “the bigotry of low expectations” to outright racism. When the union demanded more control over the classroom via stronger disciplinary measures, civil rights organizations and Black militants reacted negatively. From their perspective the unions situated the strike that unfolded over the controversy as “striking for the right to put black and Puerto Rican children out of class more easily.” (Ravitch, 327) Yet, forty years after the Ocean Hill–Brownsville controversy, many of the same education issues remain on the table. The continuing decline of urban public schools, funding inequalities, and credentials of city teachers remained flashpoints of conflict. Just as Rhee’s reforms drew applause from segments of conservative and liberal America, the burgeoning charter school movement shared support from minority parents and conservatives. Though many minority parents might recoil at other aspects of the conservative agenda, the plight of their children in failing public schools creates strange but powerful bedfellows. Whether or not conservatives really care about school reform or are using it as a cover for privatizing public educational systems continues to be a mystery. One could make a similar argument for liberals who continue to support the public education. Many middle and upper middle class liberals speak reverently about urban educational institutions but send their own children to private schools or well-funded suburban public high schools. As already noted, the fetish for middle class support pervades much of educational reform discourse. Just as teacher vilification has historical precedent, so too does the privileging of middle class interests. Does this sound familiar? Board of Education president William Wood uttered these words in 1878, thus, illustrating the dominant influence of the middle class on educational and municipal reform. Modern day tropes about meritocracy and the traditional middle class belief in education as a means to advance in a meritocratic system serve as the driving forces of this credo. From 1878 through the long twentieth century, the need to address middle income interests pervades discourse. In this way, educational reformers have long struggled to develop a rubric by which to identify good teachers from mediocre ones. Over the past twenty years, one means by which this has unfolded has been an undeniable emphasis on testing as the primary evaluation regarding teaching ability and student academic retention. The pressure on principals and teachers to raise student test scores can lead educators to fudge numbers or cheat in order to ensure that student test scores are high enough so that students succeed and schools are thought to be successful. One noteworthy cheating incident on standardized tests occurred in Atlanta, where in 2010, 58 of 84 elementary and middle schools were accused of changing student answers on standardized tests. The findings were based on analysis of tests that found that the exams had many more erase marks than is statistically probable. The superintendent and other educators vehemently protested these findings and last August another analysis of tests found that the first study was wrong and the district was largely exonerated. This accusation of cheating in Atlanta was partially based on the fact that schools in Atlanta had made dramatic gains on test scores in a short period. Districts are under immense pressure to make huge gains in a short period of time, but if a district does make these gains it may come under suspicion that it used improper or illegal methods to achieve widespread student improvement. There is a still a widely held perception that it is virtually impossible for large urban districts to achieve success, so success is met with suspicion. Classroom cheating earned the attentions of economists Steven D. Levitt and Stephen J. Dubner. In their 2005 best seller, Freakonomics, the two economists uncovered cheating patterns in Chicago public school classrooms. While tests have always served as incentive to cheat, as Levitt and Dubner point out “high stakes testing has so radically changed the incentives for teachers that they too now have added reason to cheat.” (23) While this cheating occurred during the aforementioned Arne Duncan’s watch, the two economists exonerated him from blame. “When Duncan was a boy, his afterschool playmates were the underprivileged kids his mother cared for,” the authors wrote. “So when he took over the public schools, his allegiance lay more with schoolchildren and their families than with teachers and their union.” (33) Duncan’s pursuit of classroom cheaters netted only 12 dismissals but according to Levitt and Dubner, the psychological effect was enough to reduce cheating by nearly a 1/3 the following year. More recently, no large urban district achieved success more quickly or famously than Washington D.C. 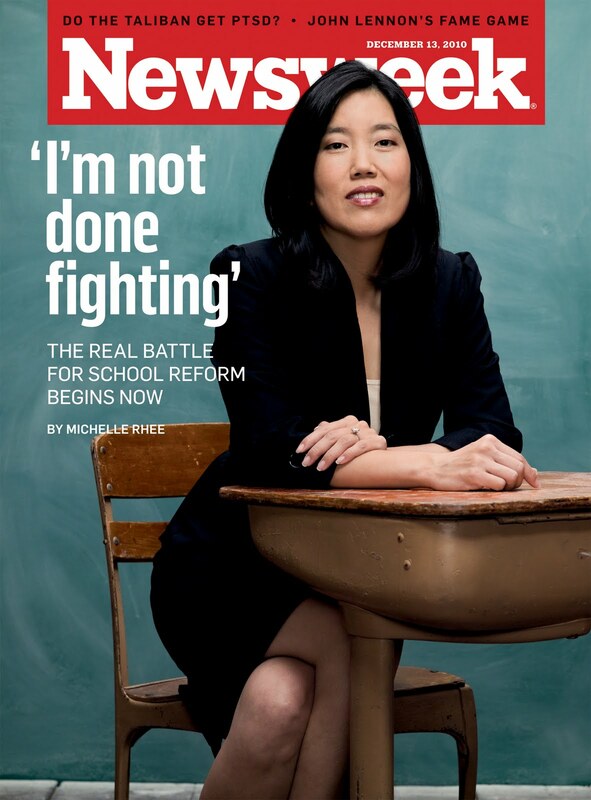 Under Michelle Rhee schools were driven to make large gains in short periods of time, and principals and teachers would be fired if they did not make the gains that Rhee was looking for. A USA Today investigative report on cheating in D.C. public schools reported that Rhee fired “dozens of principals and at least 600 teachers”, and according to one former D.C. principal Rhee told principals that they had to increase scores on standardized tests by 10 percentage points every year. Some schools in Washington did make outstanding growth in a short time, and Rhee rewarded the principals and teachers with huge bonuses. Now that Rhee is no longer chancellor schools that made huge gains when she was chancellor have rapidly falling test scores. The USA Today investigation found that one school that Rhee repeatedly singled out as being outstanding is being investigated for erasing incorrect answers and marking correct answers after students had finished their tests. While it is certainly understandable to target teacher cheating so fundamentally, this focus ignores other critical aspects of “cheating.” Is it cheating when the state board of regents waters down state exams? Any New York school teacher with enough experience knows that New York regents exams of the early and mid 1990s differed markedly in difficulty from current incarnations. How about the way tests are graded? In New York, United States and Global History and English exams are all graded in relation to a rubric. The exam score is not based on raw point totals. Instead, students accumulate so many multiple choice and short answer points that are then cross referenced with their essay scores. (Students are expected to complete a thematic essay and a document based essay for history. English exams are based far more on essay writing in that they have fewer multiple choice questions and require four essays.) Thus, if a student had a raw multiple choice score of 28 (which combines 50 multiple choice questions and 9-12 points based on short answers to documents) and a combined essay score of 5, they receive a “local” passing regents score of 55. Now consider the fact that out of a possible 10 essay points this student received only half and less than half of the multiple choice/short answer total. When George Bush talked about the “bigotry of low expectations,” he and others apparently did not consider this aspect as part of the discussion. The push by administrators to improve scores can reach fever pitch in this atmosphere, as educators are ordered to “scrub” for points when students fall just short of the 55 or 65 threshold. Recently New York City announced that it would begin to more vigorously audit schools’ test scores after data was released that on the five Regents test students need to graduate from high school many more students scored the minimum passing score of 65 than scored 64 or any other score. This news would not come as a surprise to any New York City high school teacher who has sat in a room with other teachers grading their own students Regents exams and trying to find points for students who are just below the passing threshold. As New York has moved to an A-F grading system for schools and has made it easier to close schools, the pressure on teachers and administrators to find extra points for students becomes even more acute. The pressure on schools to raise test scores does not only come from superintendents and mayors. The No Child Left Behind law that was passed in 2001 mandated that schools had to make Adequate Yearly Progress (AYP) or schools would suffer specific consequences. No Child is due to expire this year and Congress will likely reauthorize the law in the next year. There is bipartisan agreement that No Child Left Behind needs to be fixed, but Republicans and Democrats do not agree on what the fix should be. Recently President Obama and Secretary of Education Arne Duncan highlighted one problem with No Child Left Behind: if the law is not changed by 2013 80% of schools in the United States will not be making AYP and will be designated as failing. The reason that 80% of schools would be failing in a couple of years in that NCLB mandates that by 2014 every student in the United States must be making AYP. This provision of the law has been compared to mandating that a police force in a large city completely end assault in 10 years, and nobody thinks that all students will be making AYP in three years. It is absurd to mandate that every student meet an arbitrary standard by an arbitrary year, but it would be instructive to explain what meeting AYP means and why it is so difficult for so many districts to meet this standard. The first thing to know about Adequate Yearly Progress is that is does not actually measure progress. Improvement by schools does not factor into making AYP. Schools must meet a standard set by the state and if they do not meet this standard then they are designated as a “School in Improvement”. To parents and the media they are designated as a failing school. What makes it so difficult for schools to avoid being labeled as failing is that schools must meet AYP in both math and reading in every demographic group. So a school that is meeting state standards in 17 demographic groups will be designated as failing if one group is not meeting standard. The motivation for creating these rules was sound. The federal government wanted to ensure that schools were not meeting standards by ignoring historically difficult to educate groups such as special education students or African-American males. However, the practical effect of writing the law with AYP is that schools that are making progress still never meet AYP standards. Once a school is designated as being in improvement students at that school have two options: they can either transfer to another school in the district that is making AYP or they can get free tutoring that is paid for by the district. Most students do not transfer to different schools and in some districts no school is making AYP so students have no place to transfer. The free tutoring that students from failing schools are eligible for is paid for by Title 1 money from the federal government and is provided by private tutoring companies. This free tutoring was a centerpiece of NCLB because it gave the private sector the opportunity to provide tutoring to students whose teachers were failing to provide them a good education. The reality is that there is practically no oversight of these tutoring companies other than to assure that they are not hiring criminals. Many of the people who provide tutoring have no education background and school districts have found that this private tutoring has no overall positive impact on students’ performance on standardized tests. The different provisions of No Child Left Behind, mayoral control of school systems, challengers firing teachers and principals and the proliferation of charter schools are all recent attempts to close the massive gaps educational outcomes that plague the United States. Ending this inequality has been the goal of education reformers for at least the past 50 years and these new ideas and trends are the current manifestation of this goal. The increasing calls by elected officials and education reformers to make it easier to fire bad teachers is based on research that says that teacher quality is the most important factor in whether a student succeeds in school. Over the past two decades, most urban school systems adopted increasingly stringent rules for attaining teacher certification. More and more states now require that public school educators earn Master’s degrees. Few people would dispute that generally this has been a positive development. However, as both authors’ can attest, MA programs in education spend too much time on the wrong things. Most classroom teaching skills must be honed on the job. Methodology and pedagogy courses remain useful in small doses, but no amount of graduate school classes can replace the value of actual classroom experience. Most education programs would benefit from a more intense focus on content. Often, new teachers struggle with mastering the core material of their course whether it be Global or U.S. History, Chemistry, or English. The state’s focus on less than useful pedagogy courses and teacher certification exams becomes more tax on educators than anything (ask any New York City teacher about their videotape evaluation in which teachers must tape themselves then send it to Albany for approval, often one of the last steps in permanent certification. It costs the teacher $80 and the rumor has always been no one actually watches these tapes). Yes, unions play a troubling role in this matrix. The emphasis on seniority and certification devalues the energy and enthusiasm younger teachers bring to education. Both authors’ have witnessed decaying bitter older teachers occupying teaching spots that would be far more affective were a younger, fresher more dedicated face given the responsibility. This is not to say older teachers do not pull their weight, the vast majority do. In fact, truly invested and experienced teachers can serve as invaluable sources of inspiration and guidance for newly minted pedagogues. While the union’s privileging of experienced teachers makes sense, it also can be counter productive. 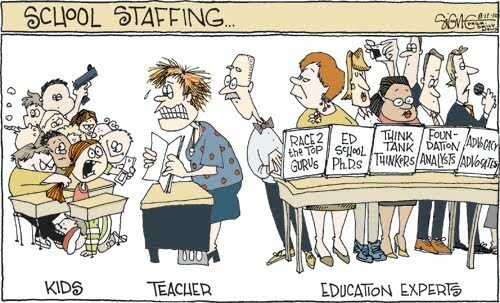 In recessionary times like today it can be virtually impossible for a young teacher to keep his job if a district lays off teachers based strictly on seniority. These young teachers either have to become substitute teachers, or if they are fortunate, they may be able to find a regular job at a different school. Since districts are unlikely to hire new teachers when it is laying off current teachers it can become difficult for a young teacher to gain the seniority needed to keep his or her job and the laying off process can repeat itself year after year. It is very difficult to become a better teacher when starting over at a new school every year and can have a negative effect on student learning. One of the major goals of education reformers and politicians is to end the “first in first out” seniority rules that are employed by about half of the states. For example, in New York Mayor Bloomberg recently said that New York would half to lay off 4000 teachers if the New York state legislature did not modify the law regarding layoffs based on seniority. The legislature has not yet acted on the mayor’s request, but the calls for reform are also coming from Andrew Cuomo, New York’s new governor. The focus on seniority rules is part of a broader argument about the effect of teacher quality on student achievement. As was discussed earlier in this paper, arguments about education reform are nothing new. However, in the past education reformers discussed parental involvement, cultural factors, and class size, as well as teacher quality. Recent studies that have argued that teacher quality is the most significant factor in student achievement have led to a renewed emphasis on trying to find ways to work around or eliminate seniority rules in order to ensure that the best teachers will be in the classroom. Frequently cited Stanford economist Eric Hanushek has produced research focusing on teacher quality. Hanushek found that students in a very bad teacher’s class will learn about half a year’s material in a year, whereas a student in a very good teacher’s class will learn about a year and half of material in year. Hanushek calculated that in terms of world education ranking the U.S. could move from below average into the cluster of highest performing countries simply by replacing the bottom 6% to 10% of teachers with average teachers. It is studies such as these that lead politicians to call for not only scrapping seniority based systems, but also for calling for more stringent evaluation of teachers and the ability to fire teachers. There is a case to be made for making it easier to get rid of poor teachers, but the primary problem with this argument is that nobody has yet created a system or metric that fairly and accurately evaluates teachers. One of the primary criticisms of teacher evaluations is that in most school districts nearly all teachers get satisfactory ratings. A 2009 study by the New Teacher Project found that in districts that use “satisfactory” and “unsatisfactory” 99% of teachers are given satisfactory ratings. This same study found that districts only use teacher evaluations when they are deciding whether or not to dismiss a teacher. Evaluations were not used to help teachers improve their pedagogical skills or for any type of extra compensation for excellence. It is clear that when 99% of teachers are getting satisfactory ratings the ratings mean nothing. When the author was a new teacher he was only observed a couple of times a year by the school’s administration, far fewer than the six times a year than was required for new teacher. When the author was up for tenure after his third year of teaching he was given tenure based on about six evaluations over a three-year period. This is an extreme example as the author had an assistant principal who was close to retirement and no longer cared, but even diligent administrators have a difficult time observing new teachers the required number of times. One of the reasons for the high percentage of satisfactory ratings is that when an administrator only observes a teacher 2 or 3 times a year it is easier for him to give the teacher a satisfactory rating than having to deal with the grief that comes from an unsatisfactory rating. The recognition that the teacher evaluation system is effectively broken has led to a push to make teacher evaluations more meaningful. The Gates Foundation is leading an initiative to put cameras in classrooms to film teachers and base evaluations at least partially on what is recorded. The Obama Administration’s Race to the Top requires that states create a system for evaluating teachers as a requirement for winning money from the federal government. Teacher unions generally agree with education reformers that there does need to be a better system for teacher evaluations. However, the most contentious issue regarding teacher evaluations is whether or not test scores should be included in evaluating teachers. For years unions have vehemently opposed such methods to determine teacher quality. Teachers argue that standardized tests do not accurately reflect what students learn in a class and that using tests to judge teachers is fundamentally unfair when a teacher has no control over how well a student was taught prior to entering her class. However, with the more and more politicians calling for an overhaul of teacher evaluations the nation’s largest teacher union, the American Federation of Teachers, recently proposed using student improvement on standardized tests as one criterion for evaluating teachers. Despite this proposal by the AFT there is still a great deal of contentiousness over what is the fairest way to evaluate teachers. As state budgets shrink and teacher pay continues to come under attack it seems likely that teacher unions are going to have to agree to a more robust form of evaluation as a means of taking some of political pressure off of teachers and their unions.